You will indeed be able to benefit from a few tips to help you choose the right garden summer house log cabin. It would also be important for you to know what you can expect when buying a garden structure online. You should be aware of some important features that affect the garden summer house price and why some garden buildings that look similar at first, would appear to be differently priced. You would also want to know about some useful optional extras that you could go for simultaneously when ordering a garden structure. Enjoy the outdoors all year round, even in cooler weather. Ideal for: a space for parents to relax; a children's play area; a greenhouse for plants; a covered space for a jacuzzi. This greenhouse dome is an economical alternative to a conservatory. Turnkey product: Easy to install; weather resistant (wind, rain, snow; can be set-up and stored easily. 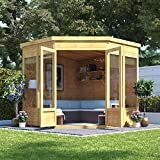 A beautiful and contemporary style summerhouse with a practical side shed provides the perfect space for relaxing and entertaining in the garden. 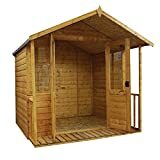 Constructed using strong and durable 12mm shiplap tongue and groove walls, roof and floor; heavy duty roof felt makes the building water-tight and protected from damage. Stylish bi-folding double doors allow you to open up the summerhouse completely whilst relaxing and entertaining in the garden. The double doors and the side storage shed are supplied with locks and keys for additional security. Some of our items are bulky and you will need to clear space in your garden ready for delivery. Providing its safe, our drivers will carry the product through to your garden to the space you have cleared. It is important you are in to sign for delivery. Attractive georgian doors and windows. Combines both a large living area and a handy side storage space. An important consideration when ordering your garden summerhouse online would be how it would be delivered. Most standard hassle free deliveries are made on lorries with Piggyback forklift trucks. Hence, your cabin logs can be unloaded as soon as they have reached their destination. Cabins are wrapped in weatherproof packaging to ensure they arrive in a great condition. What this also means is that, these cabins can stay outside after delivery if you are not ready for assembly yet. Almost all cabins from popular manufacturers come with detailed plans and drawings together with a handy assembly guide. 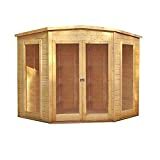 Therefore, everything you need to assemble your garden summerhouse is included in the standard kit. This includes all wooden components, windows, doors, screws, nails, roof felt and a lot more! Most cabins have fair standard prices without hidden extras, which means that things like thin 11mm roof boards instead of proper roofing boards or floor boards for an additional cost are not the case when you buy a popular garden log cabin. Most cabin components are numbered which makes installation clear and easy. The majority of garden summerhouses can be installed within 2 to 4 days, depending on their sizes coupled with your skills. Some people are quite experience in such activities whereas others may never have installed such an outdoor structure before. For a normal summerhouse installation, you need a minimum of 2 adults together with a few tools including but not limited to a hand saw, a screwdriver, a rubber mallet, a hammer, a tape measure, a drill, a knife, a pair of pliers, a ladder and so on. It is vital that you consider whether you will be installing the cabin yourself, considering the amount of effort and time that it would take, as you also have the option of going for a professional installation service too. 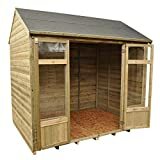 Garden summerhouse assembly, from the looks of it, appears quite easy and doable on many videos are available on YouTube. But then, you need to really be honest with yourself. If you struggle with such basics as putting a nail in the wall and if you lack any previous experience working on such stuff, then you should better consider going for a professional installation service. 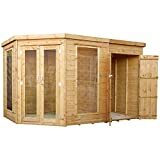 If that is not an option for you due to unavailability of an installation service in your area or due to your financial restrictions then you should at least seek help from someone who has a little more experience to help you assemble your garden summerhouse. All garden summerhouses come with a basic roofing felt. This is good to offer protection to the roof. However, roofing shingles for apex roofs together with a self adhesive roofing felt for flat roofs and pent are ideal upgrades to order to protect your structure for years to come. Roofing shingles for apex roofs will make your cabin look nice and easily last for the next decade or so. Colour options include black, grey,, brown, red and green. A self adhesive, extra strong roofing felt from a reliable brand is not only simple as far as installation goes, but also, it offers the best protection for pent and flat roofed cabins. The roofing felt can be laid directly to wooden roof boards without any underlay. When it comes to your cabin strength, wall thickness does indeed matter. You cannot usually see or figure this out when you look at an image of a structure for your garden online. However, this is a big factor which can have a great impact on your cabin price. It can make a big difference too. You will notice that, the most commonly used thicknesses for summerhouses vary from 28mm, to 70mm. 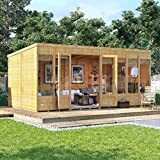 A general advice is that, you would better avoid any summer house with a wall thickness under 40mm, unless of course you are merely opting for a small shed for storage or a summer house of upto 7 square metre. A thicker structure wall will make your summerhouse sturdier and offer better resistance to weather changes. Moreover, the lifespan of your summerhouse will also be much longer. Cabins with thicker walls come with additional metal rods. These are to be put into walls for additional strength. Double glazed doors and windows form part of any garden summer house whose walls are 44m thick or more. Many suppliers use 28 mm thick wall planks for their smallest summer houses and sheds. 40mm wall thickness for medium sized seasonal garden buildings. A favorite 44mm and 50mm wall thickness for premium end log cabins. 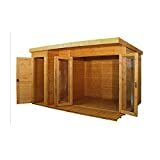 Finally, they use 70mm and 92mm planks for extra large garden log cabins and for some garden sauna cabins. If you choose to use your summerhouse all year round, then you should choose a cabin with double glazed doors and windows. Most 44mm or thicker walled summer houses have double glazed doors and windows in the standard package. Those with 28mm or 40mm walls for occasional use will usually have single glazed windows. Most window sizes are available with single glazing as well as with double glazing. Most door types are available with full glazing,, half glazed or entirely wooden doors. For the summer houses with direct entrance to the veranda, you would love to use sliding doors. They allow you to use all the terrace space without the need to leave space for doors to open. They are also very convenient to keep open during warmer times of the year and won’t slam in the wind. One garden building can have several functions. This is good to consider, especially if the space in your garden is limited. 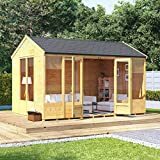 For example, by spending a little extra you can have a summerhouse together with a generous canopy to make a cozy garden dining area or outdoor kitchen. You can have a garden room, shed and a veranda all in one garden log cabin. Besides saving space in your garden, such a log cabin is also considerably less expensive than buying a summer house, gazebo and a shed. It is recommended to paint or coat your cabin with wood preservatives soon after assembly. Some stains only need two coats without a primer. This would offer protection to your cabin from the sun, moisture, radiations and decomposition for around half a decade, and you won’t need to recoat or repaint within this period.